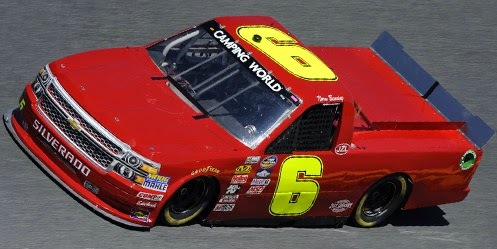 Norm Benning picked up the 6th last-place finish of his NASCAR Camping World Truck Series career in Saturday’s Hyundai Construction Equipment 200 at the Atlanta Motor Speedway when his unsponsored #6 Norm Benning Racing Chevrolet fell out with rear gear issues after he completed 12 of the race’s 130 laps. The finish came in Bennings’ 139th series start. This was Benning’s first Truck Series last-place finish since April 29, 2011 at Texas, 85 races ago. Last summer, the 63-year-old Benning made a change to his grassroots team, changing his truck number from 57 - allegedly a reference to his home state of Pennsylvania as the birthplace of Heinz Ketchup - to 6. The new number made its debut at the second-annual Eldora dirt track race, a show he starred in during the inaugural with his gutsy performance in the Last Chance Qualifier. That night, Benning again raced his way into the field and finished 22nd. He finished a season-best 17th at Charlotte earlier that year, just five spots shy of tying his career-best 12th at Talladega in 2013. At Atlanta, just 31 trucks showed up to make the 32-truck field, guaranteeing all of the entrants a starting spot in the race. The original list had 33 entrants, but the list was pared down after the withdrawals of both Win-Tron Racing’s #35, which finished last in the Daytona opener, and the #82 involved in the same wreck. Curiously, the #82 was to be driven by Travis Kvapil, who was also forced to withdraw from the Cup race due to the theft of his ride - Team XTREME Racing’s #44. Benning was the slowest driver in the only Atlanta practice, and he secured the final starting spot with an average speed of 151.928 mph, the slowest lap by nearly three full seconds. In the race itself, he completed the opening 6 laps, but pulled behind the wall under green with mechanical issues. He returned to run another 6 laps later in the event, but then retired with a broken rear gear. The next retiree was Cody Ware, who was making his series debut in th #50 Burnie Grill / Bubba Burger Chevrolet fielded by MAKE Motorsports. Ware brought out the race’s final caution on Lap 51 when he lost control in the first corner and slammed the outside wall nearly head-on. Another newcomer, Brandon Brown, saw his 4th career start end after 91 laps when the oil line broke on his #86 BrandonBiltFoundations Chevrolet. Rounding out the Bottom Five were Mason Mingus, whose #15 Billy Boat Performance Exhaust Chevrolet spun by himself on Lap 19 and eventually retired with crash damage, and Morgan Shepherd, the last-minute replacement for Timmy Hill in MAKE’s #1. It was Shepherd’s first start in the series since November 1, 2013, when he finished next-to-last at Texas in Benning’s backup truck. *This marks the first last-place finish for the #6 in a Truck Series race since October 28, 2006, when Mark Martin’s Scotts Miracle-Gro Ford crashed after 2 laps of the Easy Care Vehicle Service Contracts 200, which was run at the same Atlanta track. It was Martin’s only DNF in a season where he won 6 of the 14 races he ran, and was his only finish worse than 13th. *This marks Bennings’ first last-place finish in a Truck Series race at Atlanta.